One can seldom spot a cuckoo bee, whose peculiar kleptoparasitic behaviour includes laying eggs in the nests of a certain host bee species, let alone a couple mating. 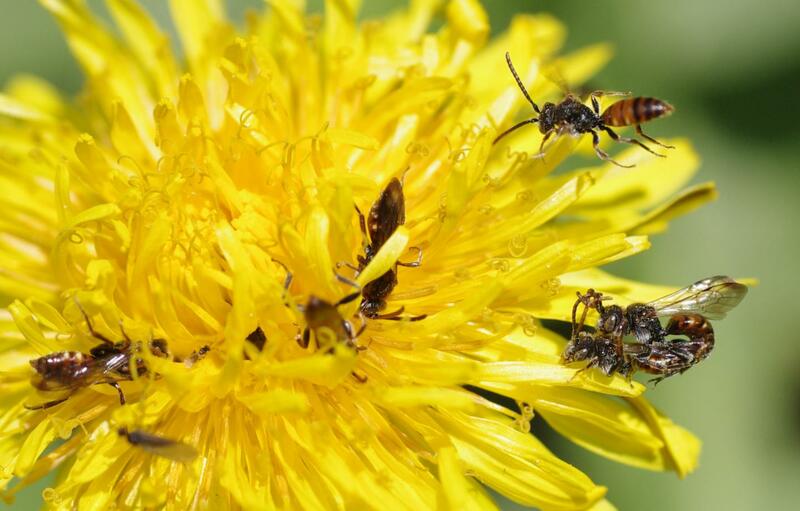 Nevertheless, German scientists – Dr. Matthias Schindler, University of Bonn, Michaela Hofmann and Dr. Susanne S. Renner of the University of Munich, and Dr. Dieter Wittmann, recently managed to record copulation in three different cuckoo bee species in the genus Nomada. Intriguingly, in field and lab settings alike, the observed couples demonstrated the phenomenon the researchers called “antennal grabbing” where the male cuckoo bee winds his antennae around the female’s during copulation, thus transferring pheromones. Even though such behaviour is relatively common in Hymenoptera, this is the first known record for the genus Nomada. While the particular biological reason for the “antennal grabbing” in different species remains unsettled, the scientists discuss the phenomenon in view of both previous hypotheses and their own observations in a new paper published in the open access Journal of Hymenoptera Research. The courtship in Nomada cuckoo bee starts with the ‘swarming’ of males at willow shrubs and gooseberry or their patrolling in groups with males of the Andrena or Melitta species that will “foster” their offspring. There is no aggression among the males. They were observed to rub their bellies and heads against the grass, in order to leave sexual pheromones, thus marking the “dating spot” for potential mates. Earlier chemical studies of Nomada bees noted that the mandibular glands of males produce chemical compounds identical with those of their Andrena or Melitta hosts, leading to the suggestion that the males transfer pheromones that help the females mimic the odor of the host bee, and later enter its nest unnoticed to lay its eggs. An alternative explanation for the “antennal grabbing” is that males are spraying a substance onto the females to make them unattractive to other potential mates.